The entry-level pet containment system from PetSafe is a decent, reliable system with an affordable price tag. Certainly the best budget option, this fence does have some limitations that are worth considering. But at nearly $100 less than the PetSafe YardMax system, this basic in-ground fence offers high quality at a pretty low price. 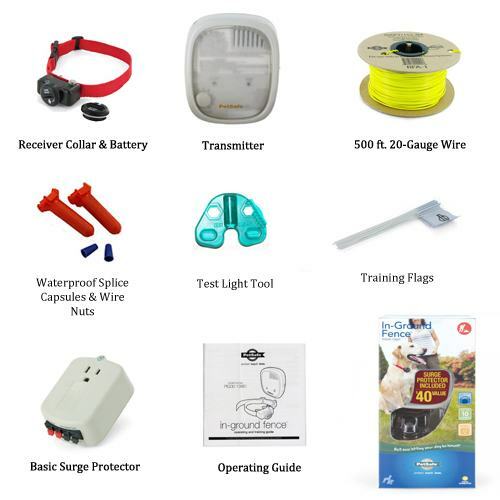 While durable and waterproof, the collar is not rechargeable and requires the PetSafe proprietary batteries. 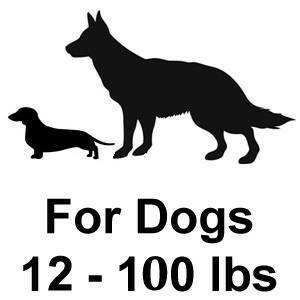 The 4 static correction levels are individually set for each collar and range from medium to high, so the collar is suitable for dogs from about 12 - 100 lbs. The system can handle up to 10 acres and is cross-compatible with other PetSafe In-Ground collars (except YardMax). 4 Correction Levels: The PetSafe In-Ground takes the collar from the retired PetSafe Deluxe. The 4 static correction levels are individually set at the collar level so the system is completely suitable for dogs of varying sizes and temperaments. The collar correction strength ranges from fairly low to high so the collar is suitable for all dogs from about 12 - 100 lbs. The tone-only setting is perfect for training. Compact & Lightweight: The PetSafe UltraLight Collar is pretty small and lightweight for collar that is not designed specifically for small dogs. The collar fits neck sizes 6"-28" and we recommend it for dogs right down to 12 lbs. Waterproof: Although this is a replaceable battery collar, the battery compartment is sufficiently waterproofed and the collar is waterproof and even submersible. We find the PetSafe collars to be reasonably durable as well. Indoor Pod Compatible: A nice extra feature for a budget system, the PetSafe In-Ground is compatible with the indoor pods that allow you to create exclusion zones within your house. Disposable Proprietary Battery: The collar utilizes proprietary RFA-67 PetSafe batteries. They cost about $8 for two batteries and they last about 3 months. Regular Contacts Only: One set of regular prongs are included with this system. While this is fine for short coats, if your dog has long fur, you'll need to purchase the long contacts seperately. Compatible With Other PetSafe Collars: Like the rest of the PetSafe In-Ground Fence Series, this system is compatible with other PetSafe in-ground fence collars including the Elite Little Dog, In-Ground Rechargeable, and the Stubborn Dog collars as well as the PetSafe Cat Fence collar. This collar compatibility is the way PetSafe makes each of it's fence systems suitable for multi-pet households. Visit our compatibility chart for a complete list of collar compatibility. Adjustable Boundary Width: The boundary width can be set anywhere from 0 to 10 ft. wide. For most installations we suggest a boundary of 3-5 ft. but a narrower boundary can sometimes be used for smaller dogs or smaller yards and a larger one for larger dogs or dogs with strong breakout drives. 10 Acre Capacity: The PetSafe In-Ground is capable of powering up to 10 acres. For those who need greater capacity we suggest the SportDog In-Ground Fence, which is compatible with PetSafe In-Ground collars. Limited Lifetime: 1 full year followed by a lifetime of fixed rate repairs. The rates are set based on the nature of the problem. About two months ago I purchased this system. I was warned by the helpful tech about the wire and they allowed me to keep my interest in what I was looking for. I was grateful they did not pressure me with this, but on the other hand I wish I would have listened. I put my wire in about two inches under the ground and did all that work for what I would now call junk wire. I wish I would have listened and it is not FlexPetz fault but I did end up calling them back about three weeks ago for their better wire. Mike was extremely helpful and although I had to buy the new wire, I feel like I should have listened in the first place and it is my fault. Anyway, I got the new wire and WOW, what a difference. I can definitely tell why they say extreme. Its so much thicker and better quality then the junk wire. I would say the upgrade is worth it and just wanted to express that. Within two moths I have placed wire in twice. I wish I would have thought enough to just do it one time.